Selected to take part in the upcoming Presidential Inaugural Parade in Washington D.C., both the Colts and Cadets have garnered attention as they make the necessary preparations to pull together their parade ranks for their march on Capitol Hill on Jan. 20. In December, 150 Cadets members were selected out of nearly 400 applicants who expressed interest in performing with the corps. The majority of the group is 2009 corps members with a handful of alumni members added to the mix. The group will meet Jan. 16 to 20 for a rehearsal camp in Woodstown, N.J., before heading out to Washington, D.C. for the parade performance. View the complete Cadets parade roster at YEA.org. With an estimated cost of $60,000 attached to the trip to DC, the Colts have received an outpouring of support from the local community to assist with fundraising. Buses are set to depart from the Dubuque area on Jan. 17, and the group will rehearse in the D.C. area on Sunday and Monday of that week before the parade on Tuesday, Jan. 20. Learn more about the Colts' trip on Colts.org. "Firm driving up donations to Colts" on THOnline.com. 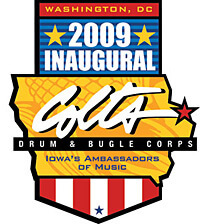 "Dubuque Colts to perform in Inauguration Parade" on KCRG.com.